As the world faces a declining bee population, California almond growers say they are doing their best to promote bee health. Over the last few weeks, bee keepers from all over the U.S. were in the Central Valley releasing bees to pollinate the almond crops. Almond growers use about 75 percent of the commercial beehives in the country to pollinate their crops, said Bob Curtis, a consultant with the Almond Board of California. “It’s the largest global pollination event, period,” he said. Between April 2017 and April 2018, beekeepers in the U.S. lost an estimated 40 percent of their managed honey bee colonies. Many growers are using pesticides and compounds at night rather than in the day when the insects are active. They are participating in the “Bee Informed Partnership,” a nationwide collaboration of leading research labs and universities in agriculture science, providing pest control advisers and other assistance to bee keepers. Tech transfer teams offer hive inspections, collect data and then make recommendations on how to maintain healthy colonies. “Keepers who have signed up for that have significantly less bee loss at the end of the season than others who haven’t,” Curtis said. Between April 2017 and April 2018, beekeepers in the U.S. lost an estimated 40 percent of their managed honey bee colonies, according to an annual survey conducted by the Bee Informed Partnership. This is 2.7 percentage points more than the average annual loss rate experienced by beekeepers since 2010-11. Researchers believe the decline in population is due to a combination of factors, including pesticides, habitat loss, fast-spreading diseases and infestation by the varroa mite. Curtis said bee keepers who work the Bee Partnership might only experience a 25 percent loss, which is still “very serious” but at least is in the right direction. He said the goal is to get the bee loss down to traditional levels of 10-15 percent. About one-third of food production depends on bees and other pollinators, according to Defenders of Wildlife. Almond growers take great interest in bee health because it is essential to their crops. Between February and March each year, almond trees burst into pink blossoms. Honey bees searching for pollen and nectar move from tree to tree, pollinating the blossoms along the way. 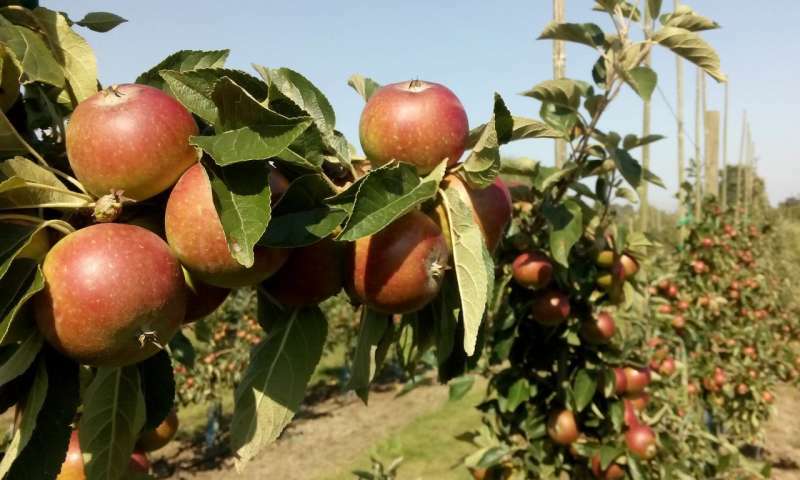 Traditional varieties of trees are self-incompatible and need bees for pollination. About one-third of food production depends on bees and other pollinators, according to Defenders of Wildlife, a national conservation organization. Bees are also essential to other California crops including tomatoes, peppers, melons, squash and cotton. 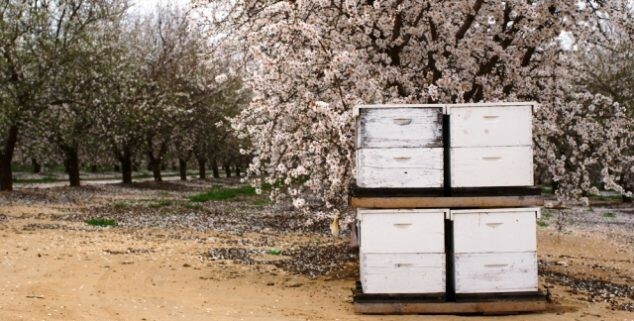 For many almond growers, the relationship with their beekeepers is extremely important. Some relationships go back many years. Bees are very focused and go through the almond trees first. But by 2 p.m., they are usually finished and are ready for something new. Gemperle works with the Newswander beekeeping family in Idaho, the same family her father worked with when he was farming. She also works with another bee keeper in North Dakota. 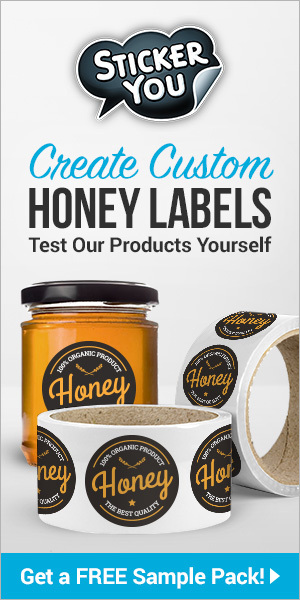 To help keep the bees on her land happy, she and her brother Eric, who farms with her, have added forage crops between rows of almond trees so the bees have another food. For them, that means adding mustard and clover. Gemperle said some farmers worried that the forage crops would distract the bees from the almond trees, but she said that hasn’t been the case. Bees are very focused and go through the almond trees first. But by 2pm, they are usually finished and are ready for something new. “All the benefits have far outweighed any argument,” Gemperle said. Farmers can get a sense of what the year’s crop might be based on monitoring bee activity. During the bloom season, which for Gemperle was about two weeks beginning around Valentine’s Day, she received daily reports on bee flight hours, what the temperature was, what the wind conditions were and more. “It’s a little window that will make or break you for the year,” she said. Every year, Gemperle hopes to harvest 2,000-3,000 pounds of almonds an acre. She knows keeping bees healthy is a critical part of the job. Previous articleCATCH THE BUZZ – Discovering the Critical Role of the Honey Bee Gut Microbiome in Health and Defense Against Parasites. Next articleCATCH THE BUZZ – The Best Way to Protect Pollinators is to Keep People on their Land. 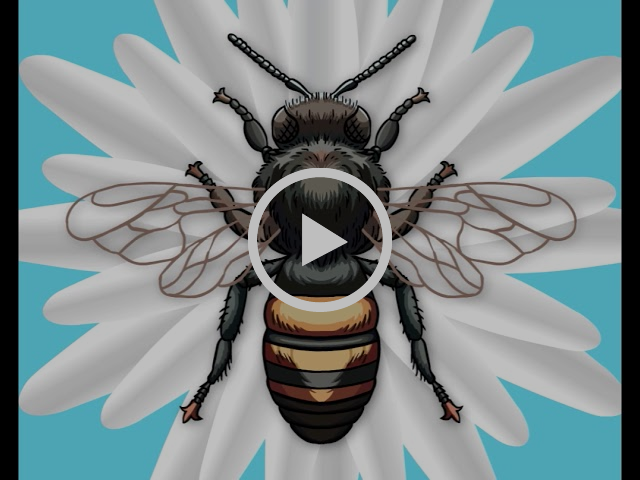 Pollinators Need People.